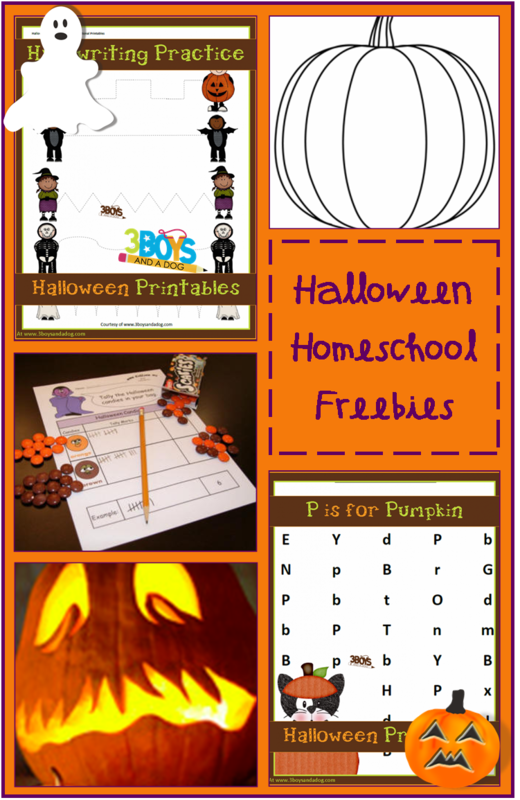 Halloween Homeschooling Freebies by subject! With Halloween just around the corner, I am sure many of us are searching online and through our hard drives for some Halloween Homeschooling freebies. Maybe this list will help you out. My good blogging buddy Kelli from 3 Boys and a Dog is here today to share some awesome Halloween Homeschooling Freebies with you guys. You know how much I love to share resources here. Well, boy did she find a bunch! Don’t homeschool? There are some really fun ideas that could be done any day of the week when your kids have downtime or utter the dreaded I am Bored statement. I like free things just as much as the next guy and in this day of internet goodies, it is EASY to find freebies. But, it isn’t always so easy to find high quality homeschooling freebies. Then, if you are anything like me, you get so sucked into the search engines that you end up filling your hard drive or using up all of your paper and still not even getting the items you went looking for to start with. This little list should make your time just a bit easier. Kidzone has many Halloween themed math printables sorted by grade! These Candy Corn Counting worksheets could be taken a step farther with some real candy corn. YUM! Get some free printable Math word problems from the RHL School. Can your preschoolers understand the differences and similarities in these Same or Different Worksheets? The Lesson Plans Page has a great estimation and sorting with Pumpkin Seeds lesson plan for grades K through 1st. Teach patterns and sequencing with these What Comes Next? printables. Teacher Vision has over 20 Mathematics activities for Halloween. Teacher Vision has tons of literature guides to scary stories and Halloween themed educational games that your students are sure to enjoy. Can your preschool and/or Kindergarten aged children find all the Ps in this P is for Pumpkin Worksheet? These Halloween Reading Flashcards are sure to help your kids improve their reading skills in a fun way! Language Arts activities for Halloween at Scholastic blogs! Spooky Stories for kids from Kaboose. These 12 easy Halloween projects for you are your little ones are sure to keep everyone having some arts & craft fun this Halloween Season! At Teacher Vision, you will find instructions for making our most popular accordion-fold books, printable masks, jack-o-lanterns, and more! Complete Halloween Lapbook at Homeschool Helper Online has a list of Library Books, online resources, free printables, and activities! Read about the tangled origins of Halloween at Teacher Vision. Learn about Halloween Customs and Traditions around the World. I thought this was kind of interesting! Learn how people tried to blend Paganism and Christianity by introducing All Saints Day instead of Samhain from the Jeremiah Project! Also, find out how trick-or-treating started. This is written by a Christian as you will see near the bottom of the historical references. History of the Pumpkin from the University of Illinois. Learn about the Origins of Halloween from Family Management. Science Activities eBook from Supercharged Science. Evertything you need to spook your house, freak out your friends, and create a mad science lab! Science Experiments and Ideas from Science Bob’s Blog. From glowing drinks to slime, it is all here! Make Glowing worms and other spooky science recipes thanks to Steve Spangler’s Science! Four easy Halloween Science experiments for your homeschooling classroom from Associated Content. Print this yummy pumpkin seed snack recipe from Teacher Vision. Tons of Handmade Costumes your kids could make! If your kids can make shorts then they can make Witches Britches! 100 Halloween Recipes at Food Network! You could also make any of these yummy recipes!